Indonesia’s missing motorcycles point to a deepening demand hole in Southeast Asia’s biggest economy. What’s more worrying for investors is that President Joko Widodo has so far done little to fill it. Motorbike sales – an important indicator of Indonesia’s economic health – fell a staggering 36.5 percent from a year earlier in May. Demand for the two-wheelers, a popular mode of travel in the archipelago with patchy public transport and still-limited car ownership, has now slumped in eight of the past 12 months. The decline is intertwined with vanishing gains from trade. Prices of coal, palm oil and other commodities Indonesia that sells in world markets are falling much faster than those of the manufactured goods it imports. Even more disconcerting is Widodo’s failure to offset the shortfall. Early in his tenure the new president scrapped wasteful fuel subsidies that cost the government $20 billion last year, raising expectations of a meaningful increase in public investment. Upgrading roads, ports and public transport would boost the economy’s potential while also putting more money in people’s pockets. But fiscal spending so far in 2015 has been only about 30 percent of the full-year target, according to DBS Bank. The economy needs stimulus. The International Monetary Fund expects GDP growth, which sunk to a five-year low of 5 percent in 2014, to slow further to 4.7 percent this year. Monetary easing isn’t much of an option. The central bank has reduced interest rates just once this year. Lowering rates further could extend the 7 percent slide in the Indonesian rupiah against the U.S. dollar this year, potentially spurring inflation by raising prices of imported goods. Foreign investment is already stagnant because of waning demand from China for commodities and a slower-than-expected pickup in infrastructure investment. International capital has also been spooked by Indonesia’s increasingly virulent economic nationalism, which led to the disbanding of the oil and gas regulator in 2012 and a ban on private participation in the water industry earlier this year. Pending a revival in private investment, government spending will have to fill the hole in Indonesian output. It’s the only way for Widodo to get those missing motorcycles back onto the roads. 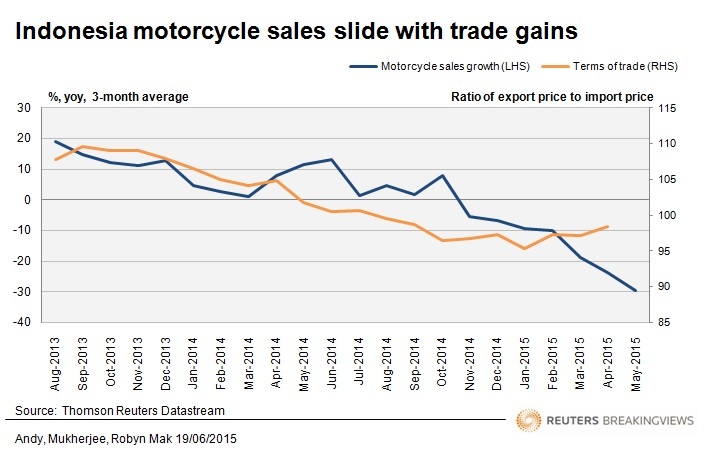 Indonesian motorcycle sales in May fell 36.49 percent from a year earlier, industry association AISI said on June 15. The International Monetary Fund has cut its forecast for Indonesia’s GDP growth this year to 4.7 percent, from a previous estimate of 5.2 percent, IMF deputy managing director Mitsuhiro Furusawa told journalists in the Indonesian capital on June 16, according to the Jakarta Post. The economy grew 5 percent last year.